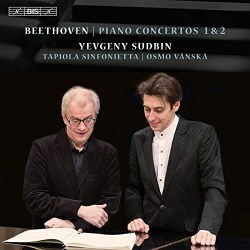 With this release, Yevgeny Sudbin completes his Beethoven cycle. Or does he? For those following the series, the Fourth and Fifth concertos were recorded in 2009/10 (review), and the Third coupled with Mozart’s K491 in 2011/12 (review ~ review). Surrounding and following the latter were ructions in the Minnesota Orchestra, including the resignation of conductor Osmo Vänskä in 2013, which seemed to spell doom for the cycle’s completion. Then there was talk that the job would be finished with the Tapiola Sinfonietta, and so it has eventuated. There are timing issues with this venture, however, which in hindsight make it appear a little peculiar, contractual arrangements aside. The first instalment appeared fairly promptly after the final recording sessions, but the second instalment and now the latest, released at the end of March, each took a good year or so. Checking their website, life has long returned to normal for the Minnesotans, with Vänskä back at the helm, so you might now ask yourself what all the fuss was about, and why isn’t their name on this final instalment? All this may be irrelevant if each recording is considered in its own right, but it’s difficult not to view the Sudbin/Vänskä Beethoven partnership as a single body of work, and reflect on its integrity. There is one particular aspect that occurred to me as I began listening to the new disc, and that is style. As also noted elsewhere, Vänskä’s way with Beethoven in Minnesota has had a touch of the HIP about it, but still grounded in a twentieth century orchestral sonority. The very first bars of the C major concerto heralded, to me, a HIP-ness beyond which Vänskä had gone before. It might be explained by the sparer sound of the Tapiola Sinfonietta, or perhaps some artistic inertia in the Minnesota Orchestra, but there was now a clearer sense of clipped, accented phrasing, and an assertiveness more typical of a period performance. This, I hasten to add, is an observation only, more a ‘heads-up’ to readers who may, on the one hand, favour a more HIP approach or, on the other, think Vänskä had already gone far enough. There’s certainly much to be impressed – even dazzled – by the playing here, with an exuberance and energy which never seem to let up, and a remarkable rapport between soloist, conductor and orchestra. Witness the razor-sharp sforzandi, and the mercurial but subtle rubato which seems to derive from a single intelligence. Sudbin’s pianism is, as ever with Vänskä, a model of give-and-take, and supremely assured, his fast passagework effortless and unforced, bursting with joie de vivre. Neither does he miss the poetry of the gentler writing, each concerto’s middle movement not so much a breather from the ebullience fore-and-aft, but an expression of musical power and beauty through the melodic line, his impeccable touch and control of dynamics and rhythm yielding sublime results. The Tapiola Sinfonietta, with a nominal strength of 41 players, provides supple, sonorous and punchy support – the kind of band you think Beethoven would have prized, if not only dreamt of. All good? Well, not necessarily. Once past my initial bedazzlement, including the usual superlative BIS sonics, I became increasingly aware of a self-consciousness about these performances that excluded them from easy recommendation. While there is so much to applaud, at times they approached a level of hyperactivity which made me long for respite and repose, or at least some cardio-pulmonary normality. No, I’m not talking about HIP, or the Beethoven-on-steroids of a Toscanini or Carlos Kleiber, but a different and stranger kind of chemistry that to a degree had lost sight of the composer, and was using him more as a vehicle for virtuosic self-expression. This was plainer with the first concerto (chronologically the second), with its freer form and interpretive possibilities, than with the Mozartian second concerto, but even there, frenetic over-achievement was always just below the surface. For the cadenzas, Sudbin uses his own for the first concerto, and Beethoven’s for the second. That for the opening Allegro con brio, as the booklet indicates, is Sudbin’s “based on Friedman”, which I presume means the Beethoven scholar Richard Friedman. At about 2½ minutes long, it mostly sticks to the thematic material, but with flourishes that for many will push stylistic boundaries too far. I found both my patience and credulity sorely tested. For comparison, I played Stephen Kovacevich’s 1970 Philips recording (BBCSO/Davis), in which the unattributed cadenza (possibly one of Beethoven’s three alternatives) exceeds 4½ minutes without losing its grip, or straining sensibilities. Stylistic excursions also mark Sudbin’s briefer cadenza for the closing Rondo, one passage of which brought to mind the old “don’t shoot the pianist” line. I do wonder what Vänskä thought of it all. There was a tangible weight of expectation when I received for review this latest, and final, instalment of Yevgeny Sudbin’s Beethoven cycle with Osmo Vänskä. But what began with a ‘wow’ quickly became a ‘hmm...’. For all the disc’s good points, it’s a disappointing end to this cycle. Maybe Sudbin and Vänskä should meet back in Minnesota, chill out, and try again.